Dimensions (HxWxD): 1.3" x 1.4" x .15"
This Dendritic Picture Quartz Oval Pendant with Filigree Bale consists of a 1.3 inch long oval shaped, polished Merlinite stone set in a sturdy sterling silver setting with a beautiful filigree bale. 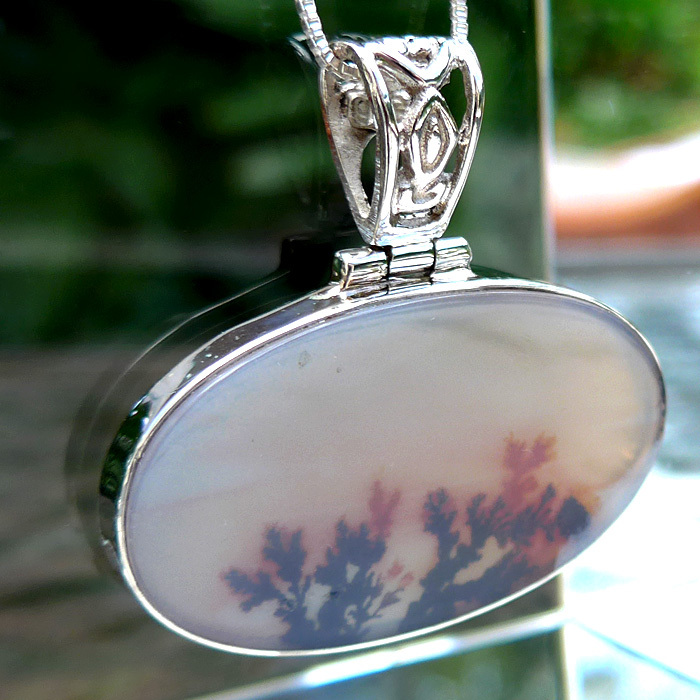 This Dendritic Quartz pendant comes with its own sterling silver chain in a velvet jewelry box. As the milky white quartz crystal was growing over long periods of geological time, tiny fissures formed along a horizontal plane within the crystal, and colorful minerals such as, most commonly, brown or black manganese or hematite, migrated into the crystal from neighboring rock formations comprising the crystal’s matrix. These new colorful mineral inclusions enter into the minute fissures within the crystal and spread out in a pattern very similar to the amazing forms seen on a windowpane during a hard winter frost. The end result over hundreds of thousands of years is a beautiful quartz crystal with a highly filigreed mineral landscape locked inside. Crystal healers and meditators use Dendritic Quartz to connect to the nature spirits and angels that govern and nurture the plant kingdom, to energize gardens and crops, and to help the individual to learn how to “talk to the plants”. Dendritic quartz helps one obtain information coded into the sacred geometry and energetic essence of all plants, herbs, trees and flowers. Dendritic Quartz is thus a manifestation stone, a stone of abundance, and magnetizes the bearer, enhancing their ability to attract wealth, health, and spiritual gifts into his or her life. 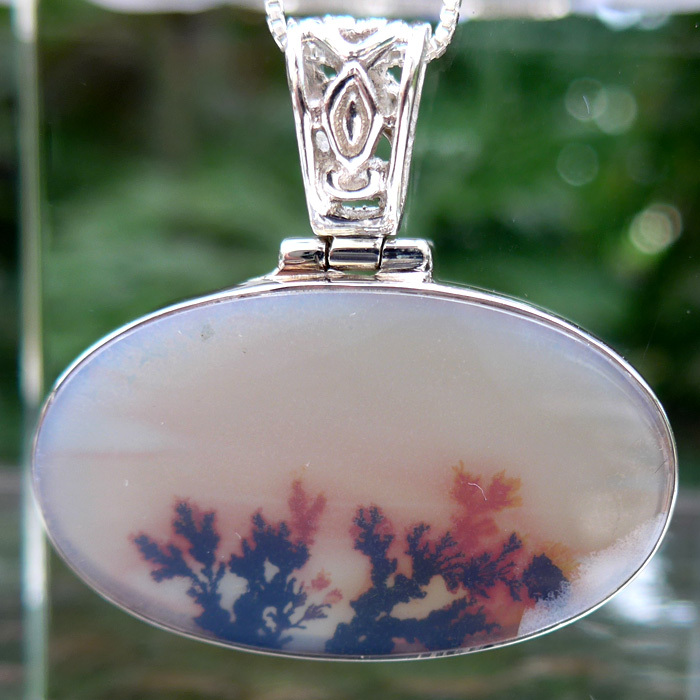 Dendritic quartz can also be used in the treatment of nervous system and skeletal disorders, since it works on all those systems of the body which, like the leaves and branches of the tree, serve to support and nourish the entire being. 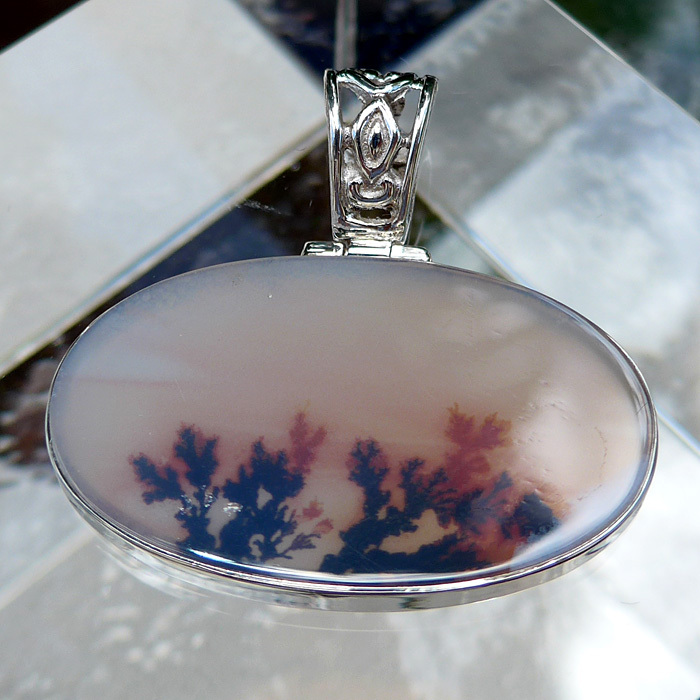 On a more subtle level, Dendritic Quartz helps the bearer to maintain equilibrium in a period when one’s life path presents a tangled “forest” of possibilities, and facilitates clear thinking and spiritual guidance which are necessary to enable the highest form of discernment, enabling the bearer to understand complex situations and to choose the one path forward which will be for the best and highest good of all concerned. Note: Above weight is shipping weight. Net weight is .17 ounce, without a chain.